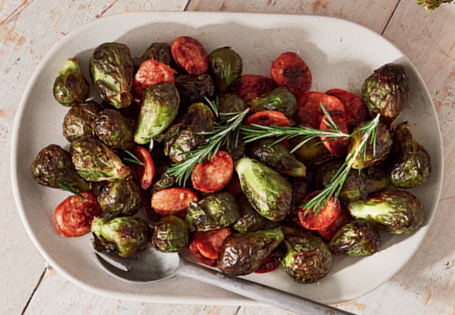 Blanch Brussels sprouts in a pot of boiling water for 5 minutes or until tender. Drain and set aside. Heat oil in frypan over medium heat. Add olive oil and chorizo cook for 3 minutes or until golden. Add garlic and paprika and cook for 2 minutes. Add Brussels sprouts and sauté for 2 minutes. Add shallots and balsamic glaze and stir through mixture. Tip: Serve with a garnish of fresh rosemary.